And, yes, Canadians will be able to order cannabis online and have it delivered through the mail — something that's illegal in the United States. Prime Minister Justin Trudeau announced Wednesday that marijuana will be legal in Canada on Oct. 17. In the meantime, its provinces and cities are working out issues concerning regulations. Here's what to expect: GOVERNMENT-RUN STORES It's up to the provinces and territories to determine how to handle distribution, and they're taking a variety of approaches. Ontario plans to open up to 150 stores run by its Liquor Control Board — a model of public ownership that is unusual in the U.S. No state owns marijuana retail outlets, though the tiny Washington state town of North Bonneville has one city-owned pot shop. Just like U.S. states, the provinces also differ on home-growing, with many allowing up to four plants and others, including Quebec, barring it. 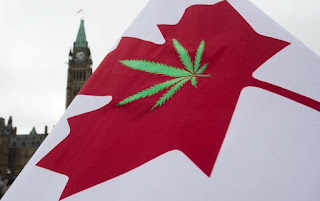 And rather than a minimum age of 21, as U.S. states have set to match the age for alcohol consumption, Canada's federal minimum age to use marijuana will be 18. However, most provinces are opting for 19, which also is the drinking age in most places. Whether run by the government or private entities, the stores in Canada will obtain their marijuana from federally licensed growers. The government also will set a minimum price. Canada's finance ministers have pegged it at about $10 per gram, but the Yukon minister in charge of marijuana says the government there hopes to displace more of the illegal market by setting the base price at $8. Because the drug is still illegal under U.S. law, major banks have been loath to do business with the industry, even in legal marijuana states. U.S. Treasury Department data show a slow increase in the number of banks and credit unions maintaining accounts for marijuana businesses, with 411 reporting such accounts last spring. But many of those institutions don't provide full-service banking, making it tough for businesses to get loans. "The major Canadian banks were slow to warm to this," said Chris Barry, a Seattle-based marijuana business attorney who handles industry transactions in both countries for the law firm Dorsey and Whitney. He said smaller independent banks, investment banks and brokerage firms got the work started. "That has pretty much dissolved as a problem," Barry said. "The majors are coming around to participate in the market." And that, Clay said, is one of many things that will make it difficult for mom-and-pop growers to thrive. Giant cannabis companies have been entering deals to supply marijuana to the provinces. While micro-producers are allowed, Clay is worried that by the time rules are released, "all the contracts are going to be scooped up."